Beautiful, folded thank you greeting card featuring an illustration of a tree with deep roots and branches surrounding a red heart. Across the tree trunk is an olive green banner with the text “Thank you”. 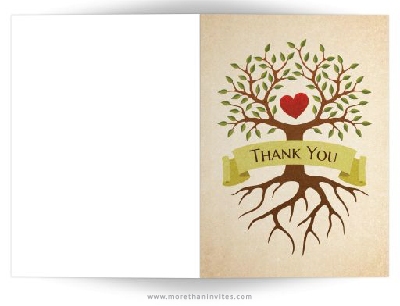 Great thank you card for family reunions, weddings and anniversaries and more. Available from Lemon Leaf prints.